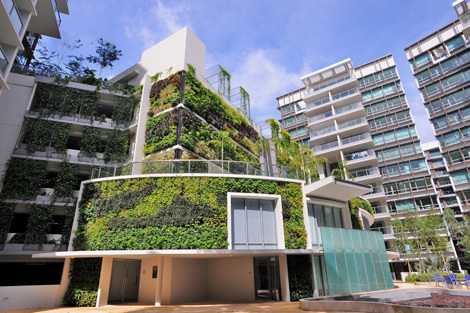 The Elmich VGM Green Walls at the Double Bay Residences in Singapore create an inviting and visually appealing green environment.The objective was to provide a green wall system to establish vertical greenery on the clubhouse façade, including the convex wall face of the 2nd level, and also a free-standing wall at the main entrance to the condominium. SolutionVertical Greening Modules (VGM), each containing a geotextile bag filled with EnviroMix® GW, a primarily inorganic soil-less lightweight planting media, were pre-planted in a controlled nursery environment. This process allows the selected plants to be firmly established and also vertically orientated before installation. 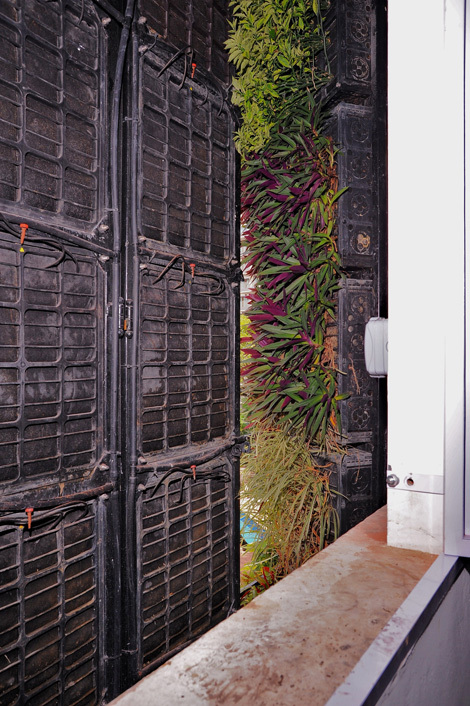 The living walls cover 140sq m of the clubhouse façade. VGM modules were anchored onto stainless steel pilasters bolted to the concrete wall to a height of 15m which includes the convex wall of the second level. At the fifth level, the VGM modules were bolted directly onto a metal framework, which enables pairs of adjacent vertical rows of VGM modules to swing inwards like windows. This allows easy maintenance access to the VGM modules mounted 15m from ground level. 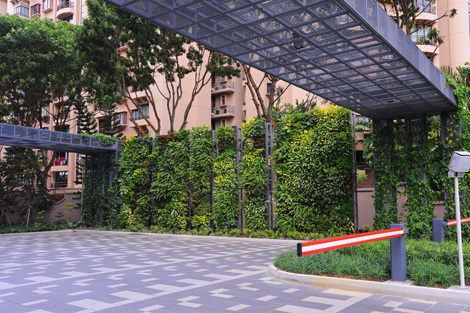 A 56sq m living wall anchored onto a free-standing metal framework at the entrance, greets residents and visitors to the condominium. 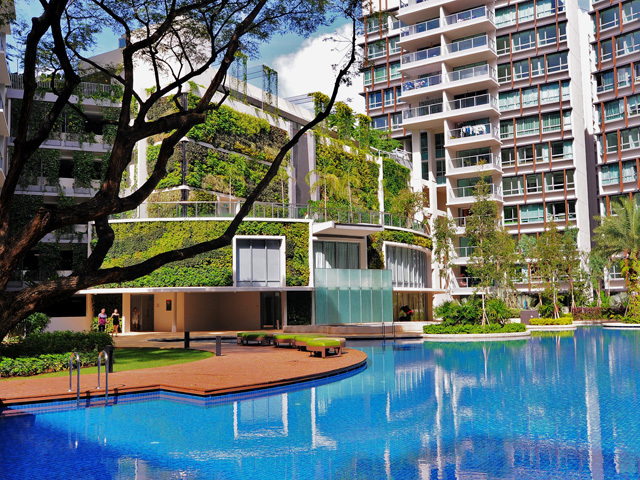 The Elmich VGM Green Walls blend seamlessly with the condominium’s landscape gardens to provide a visually appealing green environment and also help in the condominium’s environmental objectives.